A clearly defined gap has emerged over the last few weeks between the top of the table and the rest of the league. Week 17 in the Division 1 Féminine saw both the top teams maintain their sizeable advantage over the rest of the league while the race to avoid relegation continued to be a tight affair. Paris FC and Olympique Lyonnais played out their Week 16 match which had been postponed until today and the visitors picked up another impressive win to go back to the top of the table. Delphine Cascarino got the champions off to a quick start when she collected a pass from Jess Fishlock and finished neatly past the goalkeeper in the second minute. Ada Hegerberg made it two in the 33rd minute when she finished a great cross from Amel Majri but Paris came back with a goal of their own in the 44th minute as Gaëtane Thiney scored a penalty. That was all Paris could muster against OL as in the second half, the reigning title holders pulled away. In the 62nd minute Michaela Abam was the unfortunate scorer of an own goal as she tried to stop Griedge Mbock from getting to a rebound and Hegerberg turned provider in the 88th minute when she found Majri who duly clinically put the ball into the net. OL remain at the top of the standings after this win, albeit just by two points but they will be happy with their performance against one of the better sides in the division. Paris FC were shown today just how far away they are from mounting a title challenge and now that they will need to address a lot of issues this summer if they want to get into continental competitions next season. Olympique Lyonnais' victory over Paris FC was preceded by a tough win against a Lille OSC who made it difficult for the hosts this past weekend. In the 12th minute, Hegerberg was stopped by a brilliant save from Elise Launay but Lille failed to clear their lines and Dzsenifer Marozsán was on hand to finish neatly from the top of the penalty area. 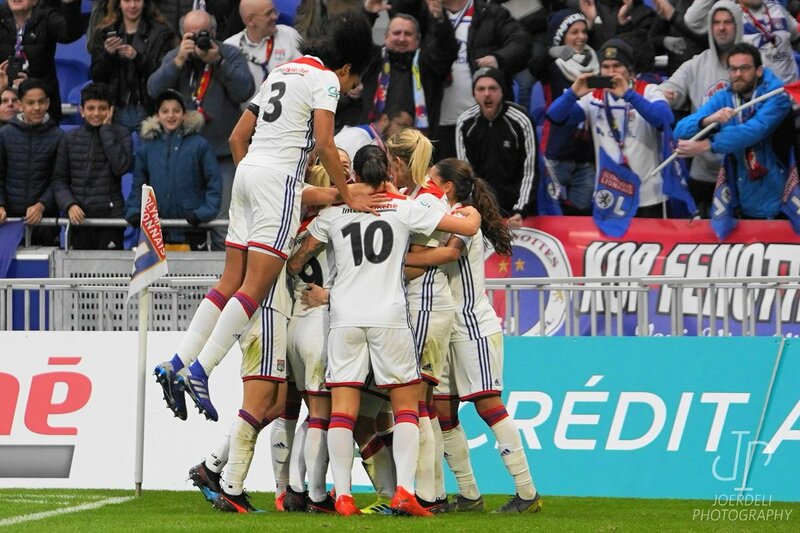 That was the only goal of the game but coupled with the win today, it was enough for OL to regain top place in Division 1 Féminine as they look towards gaining another league title. Lille OSC may be proud of only holding OL to just one goal but with no wins in five matches, the league newcomers are in danger of sliding back into the second division after just one season in the top flight. Paris Saint-Germain continued their strong start to the second half of the season with a 4-0 win over FC Fleury 91. Shuang Wang got the first goal of the game in the sixth minute and Kadidiatou Diani, who is having a world class season so far, made it two in the 24th minute. Diani got her second of the game four minutes later as she collected Wang's pass which bypassed the goalkeeper, and finished well into an empty net. Nadia Nadim then wrapped things up nicely with her second goal for her new club in the 75th minute. PSG remain right on OL's heels with this win and will look to capitalise on any slip ups by the champions. Fleury on the other hand, have now lost two in a row but are still relatively safe from a relegation battle. They will want to start picking up points again soon to avoid slipping further down the table. Paris FC also had a game this weekend before their loss to OL today and it ended up being a gritty battle against En Avant de Guingamp but they managed to come away with the win. Thiney scored the only goal of the game in the 65th minute when her long free kick bounced straight into goal untouched. That ended up being just enough for the visitors to come away with three points. Paris are remain in fifth despite their results over the last few days but they are now level on points with Montpellier HSC and will look to keep picking up points this season. Guingamp remain in seventh and eight points clear of the bottom two places. They will be happy enough with their position so far. FC Girondins de Bordeaux picked up a routine win over FC Metz this past weekend and found themselves moving up the table again due to that result. Viviane Asseyi was the first on the scoresheet in the 36th minute as she found herself on the end of a long ball up the pitch. Asseyi then tucked the ball away into the corner of the goal and put the home side ahead in the first half. The hosts then increased their lead in the 48th minute as Melike Pekel was the recipient of a great pass inside the box after some great work by Claire Lavogez, another who is having a great season so far. Marie-Laure Delie had the chance to bring Metz back into the game from the spot in the 74th minute but she hit the post with her effort. Bordeaux have now surged up into third and although are quite far away from the top two teams, they will be delighted with their performances so far this season. Metz remain in tenth, five points clear of the relegation zone but with only two wins in three, will want to bounce back from this weekend's loss. Dijon FCO proved no match against Montpellier HSC last weekend as they succumbed to a 4-1 loss away from home. A corner kick in the fifth minute allowed Marion Torrent to put Montpellier ahead and Janice Cayman doubled their lead five minutes later. Clarisse Le Bihan added the third in the 12th minute and Cayman got her second of the day in 35th minute to make it four. The second half was played out at a slower tempo due to Montpellier's dominance but Ophélie Cuynet got a consolation goal for Dijon in the 88th minute. Montpellier lie in fourth despite their win but will be happy to have come back from their loss in Week 16. Dijon also do not move from their eighth placed spot in the league despite the result and remain seven points above the relegation zone. Note: The match between Rodez AF and ASJ Soyaux has been postponed until March.